UPDATE 10-15-13: Giveaway is now closed. You might be assuming that I am posting about my blog anniversary. Nope. That was back in June. September 30 (the start of this giveaway) is actually the anniversary of the date I met my now-husband ... eighteen years ago. 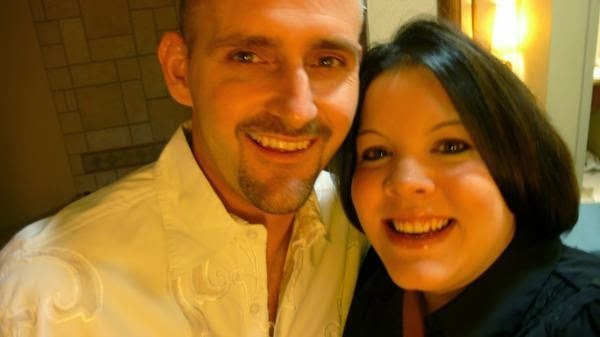 We were married in the month of July four years later, but we seem to celebrate the anniversary of the day our paths in life first crossed more than we seem to celebrate our wedding anniversary. There's a funny and unique little story about our meeting that I thought I'd share. We met when I called the wrong number. (True story.) He answered. We ended up talking for a bit. I blurted out that I was having a little shindig later with some friends at my house. Did he wanna come? But, guess what? He was a super nice, good-looking guy. It turned out that his family knew my step-father's family. His folks lived right around the corner from mine. He hung out at my house that evening for a few hours. After he went home, we talked on the phone all through the night until the batteries on our cordless house phones were dying. We have been together ever since that fall day in 1995. Fate. Destiny. Call it what you'd like. I love that the way our story together began involves a crazy, sweet story that we tell our kids and will one day tell our grandkids. 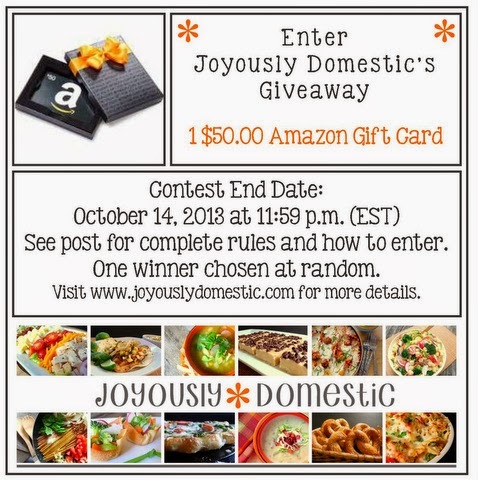 So, in honor of our special day, I'm launching another Amazon Gift Card Giveaway. You'll find the details below. The contest begins Monday, September 30, 2013 at 12:01 a.m. (EST) and will close on Monday, October 14, 2013 at 11:59 p.m. (EST). A winner will be chosen at random through an online random drawing generator site by October 21, 2013. PLEASE NOTE: This giveaway is only open to residents of the US and Canada. No comments, shares, tweets, follows or any other activity mentioned within this post completed prior to the start or after the end of the contest shall be considered as valid entries. Winner will be chosen at random. Winner's name will be announced on this blog. 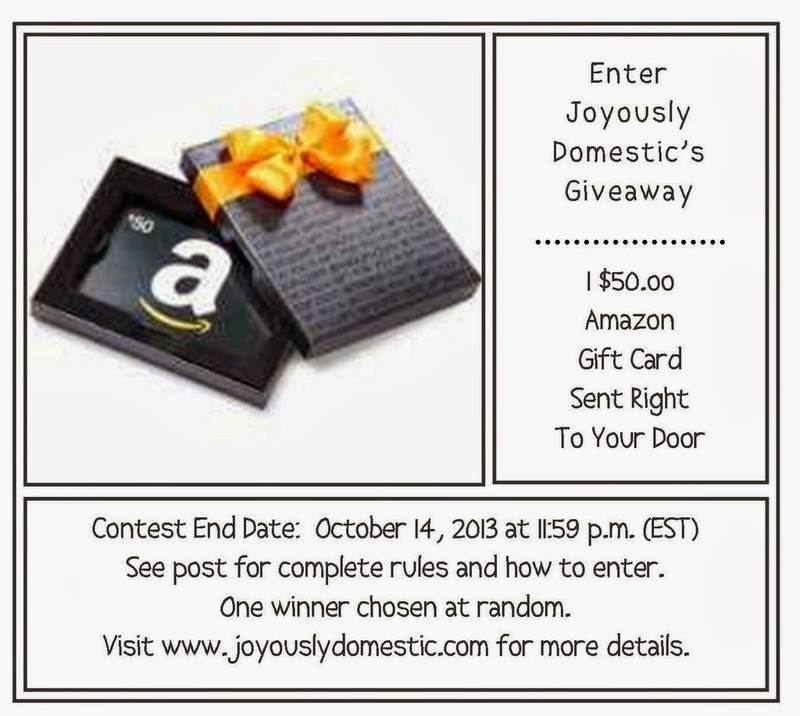 Notice that a winner has been chosen will be announced on Joyously Domestic's FB page. Winner must contact Joyously Domestic with their shipping address within 7 days of winner being announced. If winner does not respond within 7 days, an alternate winner will be chosen at random. Prize will ship within 2 weeks of winner's claim and response to Joyously Domestic. As far as the recipes go, I plan to make your baked tacos on Tuesday (Taco Tuesday). They look delicious! I would like to try your Slow Cooker "Roasted" Herb Chicken with Gravy! on my to make list this month! Skillet Chicken Parmesan Over Pasta. And it was de-lish! Wanna try the Chicken Biscuit Bake next. Hi Ang! I have made the French Onion Soup. Yummmm! I also am following you on Pinterest. jessibeagle at gmail dot com. Chicken and Biscuit Bake sounds so good. Mexican Bullseye Dip, please. That looks DELICIOUS. I'm following on Pinterest - JamieLoveSweeps. I want to make your baked tacos...probably tomorrow. They sound delicious!!! And now I follow you on Pinterest!!! Jamie Martin, JamieLoveSweeping@gmail.com = Following on G+. Kelly D, I would like to try your lasagna cupcakes recipe. My kids would love it. Slow cooker herb chicken & gravy...PLEASE! I want to try the Savory Meatballs in a Homemade Mushroom Soup Sauce -- I am always looking for ways to use meatballs other than in spaghetti! Wait. I have to pick ONE recipe I want to make? LOL I have a tie.. it's between the Sweet and Sour Sesame Chicken (which is my son's favorite) and the Savory Meatballs, because I am on a "trying new recipes with meatballs" kick. :) I just found this site and everything looks YUMMY! I am going to try your No-Bake Chocolate Eclair Cake. It looks amazing.